Visit for glimpse of a traditional fishing community. Follow a walkway or rent a canoe and paddle through the mangrove forest. Views don’t get much nicer than those over Salakkok bay in the southeast of Koh Chang. If you are bored with beaches try a try a sunset over an eerily quiet mangrove lined, mountain backed bay instead. Even in high season you’d be very lucky to see more than a handful of other tourists in and around Salakkok hamlet. There’s one man made attraction; no fancy seafood restaurants; only a couple of run down places to stay and the only activity on offer is mangrove kayaking. Doesn’t sound too promising, does it? At the moment no one goes to Salakkok mainly because there doesn’t appear to be much reason for doing so and also because you won’t notice the turn off unless you are looking for it. 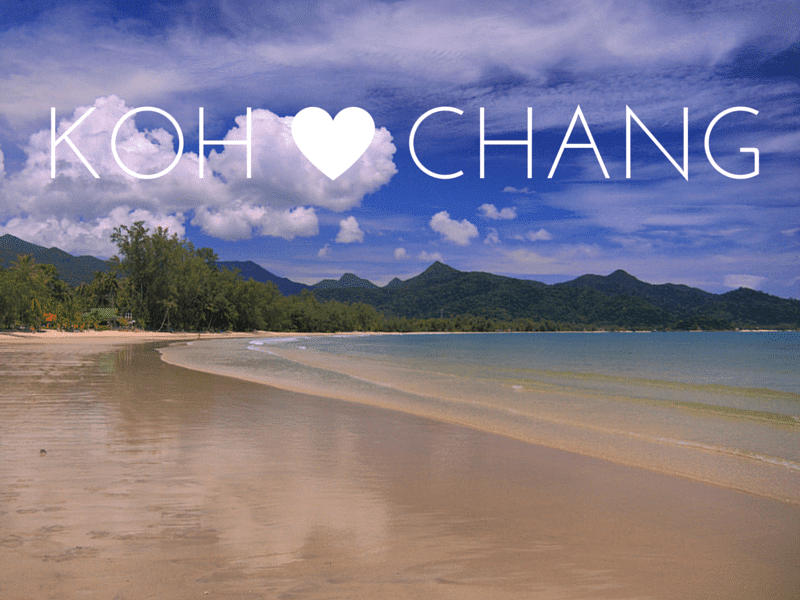 However, it really should be on your must see list of places on Koh Chang – simply because things haven’t changed there. It’s your chance to see real people, still fishing for a living as they have done for years. Plus on the main road just before you reach the turning for Salakkok there are a couple of local businesses that are well worth stopping off at. Firstly two places to grab a drink. Koh Chang’s only homegrown coffee can be found at Ban Kafae a wooden building on the inland side of the road just south of The Spa Koh Chang. Nice place to get your morning caffeine fix and you can also buy their home roasted beans too. 200 metres further on the opposite side of the road is the excellent ‘Coconut Organic Garden’ – a fruit shake shack with some simple Thai food. Run by a super friendly Thai guy who makes great shakes from fruit grown locally. You can also order food, although he might ask you to help make it if he’s busy. Don’t worry, he’ll tell you what to do. After Kooncharaburi Resort, you pass a large prawn farm on the left and you’ll come to an obvious left turn which is signposted to Salakkok and a few resorts (Ploy Talay, Judo, Rommai Chailay etc) that all cater for Thai weekenders from Bangkok. These resorts are on the eastern side of Salakphet Bay. Take the turning, about 500m down the road you come to a 90 degree left hand bend in the road, you’ll see a sign for the local temple and school with an unpronounceable long name, and will head past a few rickety wooden bungalows and small shops backing onto mangroves. You’ll also pass, on the left, a man made ‘attraction’ the Mangrove walkway which you’ll see on your left just before you turn off onto the road to Salakkok. This mangrove walkway is snaking concrete monster was built by the local authorities to allow lazy arsed folks the chance to take some photos of mangroves without making too much effort and is one of the unnatural wonders of south-east Koh Chang. The idea of the mangrove walkway is on the face of it an admirable one, to give visitors to the island the chance to explore a mangrove forest on foot via a walkway on stilts. This is the type of eco-friendly idea that you can imagine a country such as Costa Rica pulling off with award winning aplomb. Unfortunately Thailand isn’t Costa Rica and here concrete is king. The entrance / exit to the meandering walkway aren’t easy to spot, but they are opposite the entrance to the temple. One has a faded concrete plaque outside and the other is next to s small restaurant. The trail is around 800 metres in length and is built entirely in concrete with supporting poles in the ground every 4 metres. Along its length are 9 stations where an information board provides a sentence or two of details about what you can see in the area. sadly, most boards have disappeared and never been replaced. It was a nice idea but there was never enough information to be truly educational. I can’t imagine many school field trips visiting. In early 2013 a viewing platform 4 storeys tall, was erected half way along the walkway. It doesn’t really blend in with the landscape, but there are some very scenic panoramic views to be had from the top. Aside from pondering over the huge amount of concrete used in it’s construction, you’re also left wondering just how much mangrove was cut down to allow the machinery in that was used to build it. Mangroves grow slowly and until 2-3 years ago you could still see the tracks where heavy machinery had been used. But the new mangroves have now reached a couple of metres in height and so the area is regenerating slowly. So, despite it being a bit of an eyesore, it’s worth walking along it. There are some great views along the way, especially at high tide. It may come a pleasant shock to know that this isn’t the first attempt to bring mangroves to the masses in the area. Back on the main east coast road, a kilometre before you reach the turning for Salakkok & Jek Bae, you’ll see a dirt track leading off down an incline to the left, this heads a few hundred metres along the northern end of the bay. The original idea was that tourists could drive down here and see mangroves without ever having to get out of their car (it is hot after all). There are no signs of any kind and the road is a dead end, no views other than seeing mangroves that line the road. As you’d expect there was no road here originally, the track was made by dumping truck loads of earth on top of some unlucky mangroves. The edges of the track have been shored up by using concrete pipe sections as large plant pots. This is in keeping with the recurring theme of ‘not having a clue’ that runs though almost every ‘eco-idea’ the local government comes up with. Back in Salakkok, immediately after the mangrove walkway the road then heads round a 90 degree right hand turn and most people won’t give a second glance to the narrow concrete road heading off in the opposite direction as they are too busy looking out for crazed local Schumacher wannabes in rusting pick-ups heading around the corner in the opposite direction. Take my advice, turn left and take a detour along this narrow paved road. There is a small ‘OTOP’ handicraft shop on this junction if you want any locally made souvenirs or handicrafts. The concrete road is about 2 km long and is lined by mangroves on it’s left side, it ends with a few fisherman’s houses built on the shores of the large sheltered bay. Canoe rental from Salakkok Kayak Station, which also doubles as an inexpensive seafood restaurant, is now available courtesy of Koh Chang Discovery Club. This is an organisation set up by the guy who owns Baan Kwan Chang elephant camp, so it’s done with eco-friendliness, rather than simply profit, in mind. The project won an Ecotourism award at the 2007 Thai Tourist Authority Awards. Pretty much the only real award of any kind to be won by anything on the island ever. Here, you can rent a canoe and paddle yourself, following numbered markers through the canals in the mangroves and out into the bay. A great way to spend an hour or two. The restaurant is located in a community of local fishermen, in this area you’ll see real local life going on. The project is run as a co-operative, owned by the local community. Some have invested money, some work in the restaurant, some play traditional music or dance in the evenings when tourists come to go on dinner cruises in the bay – aboard a wooden Thai gondolier and some give their free time to keeping the mangroves clean and garbage free. The villagers share the profits and can now see that it is possible to make a living from tourism without doing away with their traditional life or destroying the environment. You’ll see the dinner cruises and day trips to this side of the island that include visits here, promoted in tour agents on Koh Chang, but if you simply want to do some mangrove kayaking you’ll have to make your own way here. The community here is very tight knit. They don’t really welcome outsiders who want to come in and buy up houses or want to open up businesses catering solely to tourists. The villagers all have a say in what goes on, so unless they all agree on something then it won’t get the go ahead. For example, if you buy an old house here you’d have to attend the monthly village meetings and get to know everyone before they give you permission to renovate it. Money isn’t the over-riding factor here unlike in the west coast villages. Just before you reach the turn off to Salakkok Seafood, keep a eye out for the boatyard. This is the only place on Koh Chang where wooden fishing boats are repaired. Interesting place to have a look inside, there are usually a few boats being worked on out of the water and in various states of disrepair. When you arrive at the end of the road, on the bay, you see another small fishing community of around 20 houses built on the eastern shore of the bay. You’ll notice that despite the amazing views across the bay to the mangroves and jungle covered mountains, there aren’t any real signs of tourism here. It’s an area that hasn’t changed since I first visited in 2003. This is where you’ll get the amazing views across the bay. One day, I don’t know when, it will be on the itinerary of every tour group visiting the island and there are bound to be large seafood restaurants replacing the locals ramshackle homes. On the small pier there’s usually one or two large vessels belonging to the Marine Department moored and if you are lucky you’ll see the small fishing boats coming back with their catch. The bay itself is very well sheltered as the outlet to the sea is only approx 100 metres wide and the east coast rarely sees any of the winds that batter the west coast during rainy season. It is possible to paddle out to the two islands a few kilometres away from the mouth of the bay, but there isn’t anything of interest on them – no beaches, no water, just rocky tree covered outcrops. For history buffs way back in the late 80s, during the second wave of boat people leaving Vietnam, this area was the arrival point for a lot of boats from Vietnam who skipped Cambodia, which then had a Vietnamese backed government, and tried to get to Thailand for safety. The Thai government of the time wasn’t too pleased about having thousands of refugees land on their shores and so a ‘push back’ scheme was employed whereby boats weren’t allowed to make it to the mainland. If they persisted in trying, the boats were rammed by fishermen and often sunk. When UN observers were finally allowed into in the area found a group of over 100 women and children on these small islands. They had been left with no food or water. Their boats deliberately sunk by Thai fishermen. There was no sign of any of men who had been on the boats. On the opposite side of the bay, hidden from view by mangroves, but accessible by kayak, is the luxury health spa, The Spa Koh Chang. Salakkok is the place to come to see how subsistence fishermen live on Koh Chang. This ride through video takes you down to the end of the road in Salakkok Bay. Take notes on the places to stop enroute for views and some local life. There’s very little accommodation in this area but there are a couple of resorts that can be booked on booking.com. The price shown is a typical high season nightly rate. It may well vary and expect it to be higher at holiday weekends and during peak season. A bit of a tourist trap. But you'll love the views from the pier and also across the bay from the nearby peninsula.